SpaceX’s Dragon CRS-16 spacecraft is now on its way to the International Space Station, carrying some exciting European experiments among its cargo. After being launched from Cape Canaveral Air Force Station in Florida, USA at 16:16 GMT on 5 December 2018, the supply vehicle is now circling Earth and will be grappled and berthed by the Space Station’s robotic arm on Saturday 8 December. 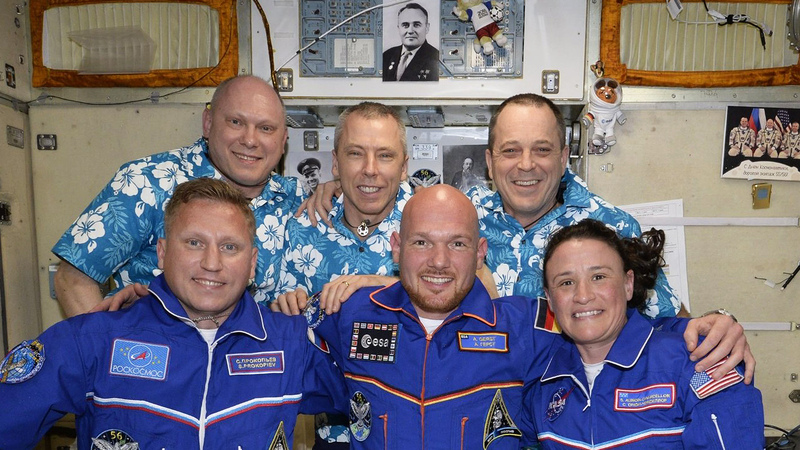 With under two weeks to go until ESA astronaut Alexander Gerst returns to Earth alongside crewmates Serena and Sergei, it is time to reflect on yet another busy week of science and operations on the International Space Station they call home. It started with the arrival of three new crew members and ended with a Dragon on board. Alexander also broke the record for the longest non-consecutive time spent in orbit by any European astronaut – 351 days. Big congratulations to Alexander and the ground crew who make such achievements possible. For the first time in history, we can hear the wind on Mars. Well, sort of. 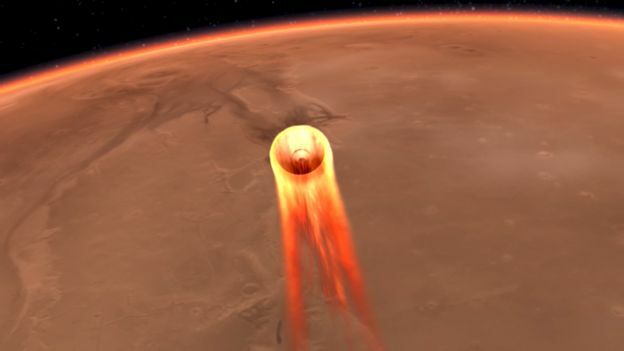 NASA’s InSight lander touched down on the Red Planet Nov. 26, and since its arrival, the robot has focused on acclimating to its new environment on Elysium Planitia. And now, the team behind the mission has turned the first bits of that data into an incredible new soundtrack, which you can hear in a new video, released today (Dec. 7). Die vor wenigen Tagen auf dem Mars gelandete NASA-Sonde Insight hat Daten zur Erde geschickt, aus denen sich die Geräusche des Windes auf dem Roten Planeten errechnen lassen. Gleich zwei hochsensible Instrumente des Geräts waren dazu in der Lage, die minimalen Vibrationen zu ermitteln, teilte die NASA mit. So konnte ein Sensor zur Ermittlung des Atmosphärendrucks sie direkt aufzeichnen, das Seismometer bestätigte die Ergebnisse. Es soll später Erdbeben auf dem Planeten untersuchen, beobachtete jetzt aber die leichten Erschütterungen der Solarpaneele durch den schwachen Wind. NASA’s Mars InSight lander, which touched down on the Red Planet Nov. 26, is starting to settle into its new home and prepare for its scientific work — and the robot has shared three new photographs of its progress with its minders here on Earth. The lander transmitted all three images taken by its Instrument Deployment Camera to Earth on Dec. 4. 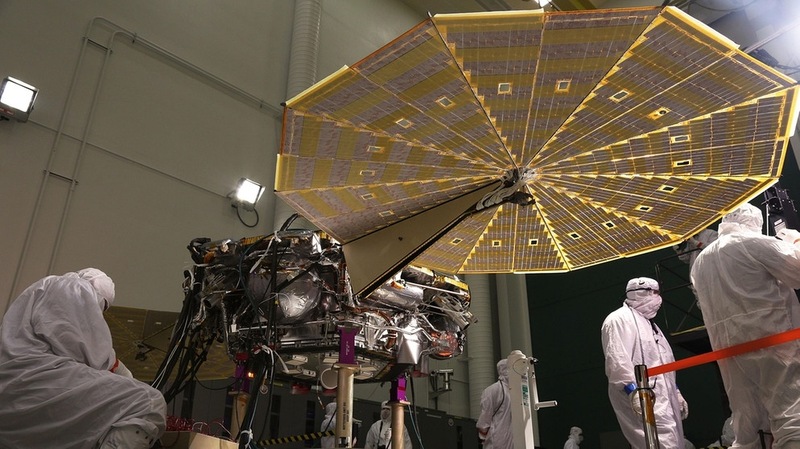 The images will help the team behind the lander make sure everything survived its dramatic journey to the Martian surface safely and will guide their decisions about precisely where to deploy individual instruments, a critical process during the spacecraft’s first weeks at its destination. NASA’s new Mars lander has snapped its first selfie on the Red Planet. Nach knapp dreitägiger Verfolgungsjagd hat der private US-Frachter Dragon mit knapp 2,6 Tonnen Nachschub an Bord am Samstag die Internationale Raumstation ISS erreicht. SpaceX’s CRS-16 resupply mission to the International Space Station has been grappled by Canadarm2 – despite being delayed by a ground station communication issue with a Tracking and Data Relay (TDRS) satellite – ahead of being successfully berthed to the orbital outpost. The mission’s arrival signals the start of a busy 37 day period with the cargo craft on a flight that – when launched – could have overlapped with SpaceX’s uncrewed test flight of crew Dragon for the Demonstration Mission -1 part of the Commercial Crew Program. A SpaceX Dragon cargo ship made a special delivery at the International Space Station Saturday (Dec. 8) just in time for the holidays. And yes, Virginia, there are Christmas treats on board. Den russischen Kosmonauten Oleg Kononenko und Sergej Prokopjew steht am Dienstag in der Internationalen Raumstation ISS eine schwere Mission bevor. Bei einem Ausstieg in den freien Raum sollen sie an der Orbitalsektion des Raumschiffes Sojus MS-09 an der Stelle, wo Ende August ein Loch entdeckt worden war, ein Stück des Meteoritenschutzes herausschneiden, das möglicherweise Spuren der Bohrung aufweist. Die Mission war „beispiellos in ihrer Komplexität“, sagte Oleg Kononenko. Über mehrere Stunden hat der Kosmonaut im All gearbeitet, dabei ist der untersuchte Teil gar nicht für Weltraumspaziergänge vorgesehen. Der Chef des russischen Staatskonzerns GK Roskosmos, Dmitri Rogosin, ist überzeugt, dass das Loch in der Orbitalsektion des Raumschiffes Sojus MS-09 absichtlich gebohrt wurde. „Das war eine vorsätzliche Handlung, ein vorsätzlicher Akt, der per Hand durchgeführt wurde“, sagte er in einem Interview der New York Times. Die russischen Kosmonauten Oleg Kononenko und Sergej Prokopjew haben am Mittwochmorgen erfolgreich ihren Außenbordeinsatz an der Internationalen Raumstation ISS beendet. Expedition 57 Flight Engineers Oleg Kononenko and Sergey Prokopyev of Roscosmos completed a spacewalk lasting 7 hours and 45 minutes. The two cosmonauts opened the hatch to the Pirs docking compartment to begin the spacewalk at 10:59 a.m. EST. They re-entered the airlock and closed the hatch at 6:44 p.m. EST. Two Russian cosmonauts ventured outside the International Space Station today (Dec. 11) to cut into a spacecraft and inspect the source of a pressurization leak that briefly plagued the outpost earlier this year. Expedition 57 flight engineers Oleg Kononenko and Sergey Prokopyev of the Russian federal space agency Roscosmos conducted the 7-hour and 45-minute spacewalk. The two cosmonauts worked on the exterior of the Russian Soyuz MS-09 spacecraft, where the space station’s crew had earlier found and repaired the leak from the inside. Kommen Sie mit auf eine Reise, die uns vom äußeren Sonnensystem wieder zurück auf unseren Heimatplaneten führt. Auf dieser Reise begegnen wir Objekten, die wir Menschen ins All gebracht haben, um das Universum zu erforschen, die jetzt aber eine grosse Herausforderung für die moderne Raumfahrt darstellen. Colorful swirling clouds in Jupiter’s North Equatorial Belt practically fill this image from NASA’s Juno spacecraft. This is the closest image captured of the Jovian clouds during this recent flyby of the gas giant planet. It looks like NASA chose the right space rock for its asteroid-sampling mission. The agency’s OSIRIS-REx probe, which just arrived at Bennu last week, has already found hydrated minerals on the 1,640-foot-wide (500 meters) near-Earth asteroid, mission team members announced today (Dec. 10). BepiColombo, die gemeinsame Raumsonde von ESA und JAXA, ist auf dem Weg zum Merkur und setzt nun zum ersten Mal auf ihrem Flug ihre Triebwerke ein. Am 2. Dezember führte BepiColombo ihr erstes Manöver erfolgreich durch und griff dabei auf zwei der vier elektrischen Triebwerke zurück. Zuvor wurde jedes einzelne Triebwerk eine ganze Woche lang getestet. Damit ist die Raumsonde ihrem Ziel, dem innersten Planeten unseres Sonnensystems, nun etwas näher gerückt. From 2014 to 2016, ESA’s Rosetta spacecraft studied Comet 67P/Churyumov-Gerasimenko and its surroundings from near and far. It flew directly through the ‚bow shock‘ several times both before and after the comet reached its closest point to the Sun along its orbit, providing a unique opportunity to gather in situ measurements of this intriguing patch of space. Comets offer scientists an extraordinary way to study the plasma in the Solar System. Plasma is a hot, gaseous state of matter comprising charged particles, and is found in the Solar System in the form of the solar wind: a constant stream of particles flooding out from our star into space. NASA’s Dawn spacecraft captured this close-up view of the central peak of the 99-mile-wide (160-kilometer-wide) Urvara impact crater on Ceres. The 6,500-foot (1980-meter) central ridge rises above the nearby terrain. The image was captured by Dawn’s Framing Camera, during XM2, on June 21, 2018 from an altitude of about 83 miles (134 kilometers). NASA announced the conclusion of Dawn’s mission operations was Oct. 31, 2018, when the spacecraft depleted its hydrazine. 2018 has been quite a year for spaceflight, but it’s not over yet, and the OSIRIS-REx mission has one more major task to accomplish before the ball drops: slipping into orbit around the near-Earth asteroid Bennu. The team will tackle that maneuver sometime on the afternoon of Dec. 31, but there’s a lot to do before the feat can take place. Two tasks in particular will occupy the OSIRIS-REx team for the rest of the month: conducting a detailed survey of their asteroid target, and plotting precisely how the spacecraft will execute the orbital insertion. NASA’s Opportunity Mars rover has been silent since June 10, a casualty of a mega-dust storm that encircled the Red Planet and led to a halt of the rover’s operations at Perseverance Valley. But Oppy’s handlers haven’t given up yet on the golf-cart-size robot, which touched down on Mars in January 2004. NASA’s Kepler space telescope captured the light of a stellar explosion that occurred about 170 million years ago. When a massive star reaches the end of its life, a bright explosion expels stellar material into space, in what is known as a supernova. Using the now-retired Kepler telescope as well as ground-based telescopes, astronomers detected the bright light of a supernova called SN 2018oh on Feb. 4, 2018. While a SpaceX commercial crew test flight might not launch on a date in early January previously announced NASA, both agency and company officials are optimistic the mission will still fly later in the month. Am 4. Dezember 2018 startete das erste von der ESA finanzierte Weltraumwetterüberwachungsinstrument an Bord des neuen geostationären Satelliten Südkoreas GEO-KOMPSAT-2. Der Satellit wurde auf einer Ariane-5-Rakete vom europäischen Weltraumbahnhof in Kourou, Französisch-Guayana, in die Erdumlaufbahn gebracht. Die Raumsonde wird im geostationären Orbit meteorologische Beobachtungen über den asiatisch-pazifischen Raum machen sowie Weltraumwetterdaten liefern. Any modern person who spends time on the internet is familiar with the basic principles of cybersecurity — but imagine you’re in charge of a satellite that people around the globe rely on. Suddenly, changing a password every few months and hoping for the best doesn’t seem quite vigilant enough. Yesterday (Dec. 10), National Geographic’s „Mars“ Season 2 returned with a heart-pounding fifth episode. This week, the fictional mega corporation Lukrum displays the holdit has on government decisions and the future of life on Mars. This episode also confronts the potential dangers of changing leadership as well as childbirth on Mars. Mit der geplanten LUNA Trainingsanlage am Europäischen Astronautenzentrum (EAC) in Köln bereitet sich die ESA auf künftige Missionen zum Mond vor. Noch ist auf dem rund 50 Meter langen und 20 Meter breiten Areal nicht viel mehr zu sehen als eine struppige Wiese und ein kniehoher grüner Zaun. Doch schon bald sollen an dieser Stelle unweit des Europäischen Astronautenzentrums (EAC) und des Deutschen Zentrums für Luft und Raumfahrt (DLR) in Köln die Bauarbeiten für die LUNA-Anlage beginnen. Das weltweit genutzte europäische Satellitennavigationssystem Galileo erweist der globalen Physiker-Gemeinde nun einen historischen Dienst. Dank des Systems wurde ein Schlüsselelement von Albert Einsteins Allgemeiner Relativitätstheorie so genau wie noch nie gemessen, nämlich wie sich die gravitative Rotverschiebung auf den Lauf der Zeit auswirkt. Die Weltraumstrahlung verkürzt bei einem zweijährigen Flug zum Mars das Leben der Teilnehmer um durchschnittlich rund 2,5 Jahre. Das geht aus den Dokumenten einer Konferenz zum Thema Luft-, Raumfahrt- und ökologische Medizin hervor, die derzeit in Moskau stattfindet. Das Ergebnis sei bei einem Test mit einem Dummy in einem kugelförmigen Raumschiff ermittelt worden, berichten russische Medien. NASA released a stunning new comparison photo to celebrate the anniversary of the first astronaut mission to repair the Hubble Space Telescope’s blurry vision, 25 years ago. Shortly after the space telescope launched, in 1990, NASA discovered a manufacturing flaw in the observatory’s primary mirror, and this affected the clarity of the telescope’s early images. During a shuttle mission in 1993, astronauts completed a spacewalk to install a replacement instrument to bring Hubble’s view back into focus. 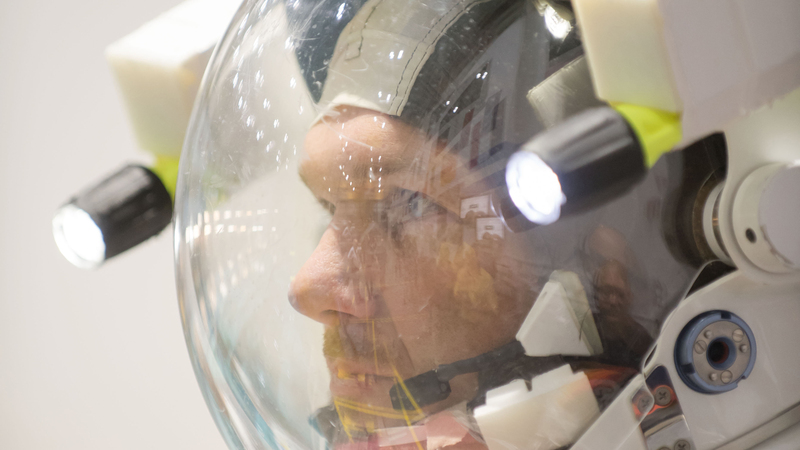 Dieser Eintrag wurde unter Newsletter, Raumfahrt, Spacecraft Mission News veröffentlicht und mit Alexander Gerst, Astro_Alex, China, International Space Station, Internationale Raumstation, ISS, Mars, NASA, NASA InSight, New Horizons, Sojuz, Soyuz, Spacecraft Mission News, Voyager verschlagwortet. Lesezeichen für Permalink hinzufügen.